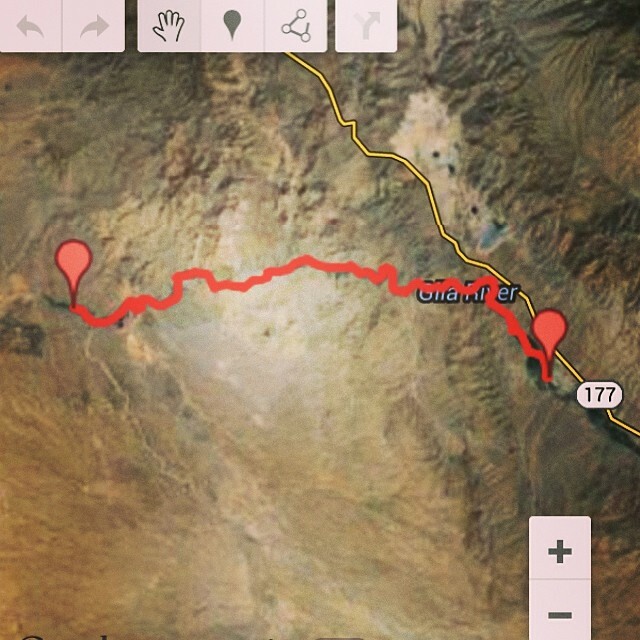 A 35 mile trek from Kearny AZ to Florence AZ on the Gila river. I was visiting dad near Florence and we fou7nd ourselves at the gila. He mentioned that he never saw anyone floating this river but he knew it flowed way out east in Kearny so it had to connect. A little internet scouting (Thank you Google Satellite) and a quick trip to Dicks Sporting goods for a canoe and I was certain I had all I needed to brave the wilds. I recruited my good friend Alex Pushman who had some experience rowing in his home state of Michigan and we were off! The Gila River is not a recreational river. Its flow is regulated by a dam and nearly dries up every year, as a result the flow changes regularly and trees and vegetation have a nasty habit of collapsing into the river, this provides hazards too numerous to avoid. More than once we’d get turned sideways by a low hanging branch we could not avoid, the boat would capsize, if we bailed out early enough we were scrambling to rescue the contents of our cooler, chasing stray beers down a brown and muddy river, if we didn’t get out in time, it was quite the thrill to have to swim out from underneath the canoe, pinned underneath a branch underwater, leaping up for air and finding yourself 30 feet away from the boat and turned in the opposite direction. This was no walk in the park, and certainly not meant for someone with my limited experience. But good times were had, we laughed and joked at our misfortunes and consistent wrecks, we celebrated small victories like we’d just conquered the earth. At one point halfway down the river, we were soaked to the bone and the sun was setting. We knew we had to make camp but we couldn’t find a suitable location as the banks of the river were walled on both sides by tall walls of desert mesquite brush too thick to traverse, and the occasional flat open spots were just marshy grass. The sun was setting behind a small mountain that I knew the river wrapped around, I proposed that if we could get around that mountain in time it would buy us an extra 30-45 minutes of daylight to dry out so we took on a frenetic pace to get around that peak. Its a precarious notion: Paddle down the river as fast as possible but proceed with enough caution to avoid flipping the canoe again in the endless eddys and underwater snags the river threw at us. But we came out the other side, relatively unscathed, and found a place to make camp. We didnt dry out and all our gear was soaked, we slept near naked on yoga mats wrapped around the campfire for warmth, and of course we hadnt gathered enough wood so sure enough, around 4 am we were both up, treading barefoot through the mesquite thorns, gathering twigs and little branches in hopes they would carry us to sunrise. Ultimately the moral of this tale: When the sales guy at Dicks Sporting goods starts yammering about spending 30 bucks on dry bags, dont laugh at him and brag about your skill with trash bags and twisty ties… You will pay the price for your hubris! Remember this scene from True Detective season 1? "Come on inside, little priest, this is Carcosa"
This Bluegrass mix-tape is gonna be fire! stay tuned for the tale of Phillip! Coors Original Banquet Beer, official beverage of the King Bee Adventure Club.